An account sent to us [via Mavis and Sergius] from Edith [Sheppard] Rutherford. 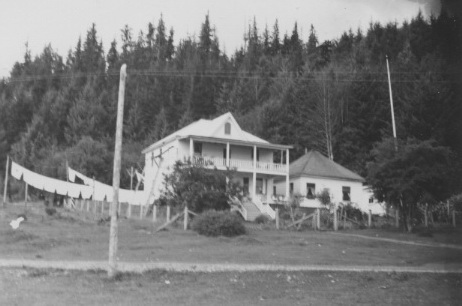 “Skidegate Inlet General Hospital in Queen Charlotte was a two-story building made of wood. On the main floor there was the office, an X-ray, a dispensary, a small operating room, a 3-bed ward, and a bathroom. On the second floor there were four two-bed rooms, one single room, a bathroom, and storage cupboards. One room was used for the nursery. In the basement there was a large furnace and a dark room for x-ray developing. The hospital had its own power plant and water supply. On August 22, 1949 it was a wonderful day. The hospital was quiet, with three new mothers and their beautiful babies, and two other patients. I was carrying blankets upstairs when suddenly the hospital was rocking violently and the mothers were screaming. A volunteer helper managed to get up the stairs past me, grab three babies and down he came. Doors and windows were jammed. There were so many tremors following the big one. Maud our cook tried to get out a window but got stuck. It took another tremor to get her out. With the great tremor there were loud crashes in the dispensary. When I finally had a chance to look in that room there were broken bottles of Lysol, Intravenous solution, Caroid and bile tablets and numerous smaller bottles on the floor – one awful mess of broken glass combined with pills and a mixture of Lysol and Intravenous solution which had to be cleaned up by me. I do not know when this building was built or if it was always a hospital. The structure proved to be well made when it survived this earthquake. written by Edith [Sheppard] Rutherford- Matron of hospital at that time.